An aerial shot of the Snake River looking north between Pancheri Drive and Sunnyside Road. On the west bank of the river is the 400-acre Snake River Landing development, still only partially completed but once a gravel pit for Monroc. Urban renewal and tax increment financing have made the land more feasible to build on. The Idaho Falls Redevelopment Agency’s annual report will be presented for discussion and approval at its regular monthly meeting, at noon Thursday in the City Council Chambers, 680 Park Ave. The annual report summarizes the agency’s activities for 2015 and provides a brief history of its actions over its 27-year history. As with all of agency meetings, the public is invited to attend. How does urban renewal work? Say a city council wants to see an area developed but the land is too blighted or rocky to make it economically feasible (in Idaho Falls’ case, lava rock can make some land very expensive to build on.) Under a law passed in 1965 by the Idaho Legislature, the council can form an urban renewal agency. With the city council’s approval, that agency has the authority to designate certain parts of the city as urban renewal districts. For the 20 years that follow the land is taxed as it always has been but any taxes on increased property value in the district go to the redevelopment agency, which directs the money to the city for streets, water and sewer and power lines. Soon after the agency was activated in 1988, Idaho Falls Mayor Tom Campbell and the City Council created the Lindsey Boulevard Urban Renewal District (which has since been expanded into the Snake River Urban Renewal District.) This area contained numerous vacant parcels, open storage and gravel roads. The agency issued a bond and undertook the reconstruction of Lindsey Boulevard and Utah Avenue, then Utah Avenue, Wardell and Mercury rights-of-way and Memorial Drive. The agency has also relocated power lines, improved major road intersections and railroad crossings, and replaced or installed water, sewer and storm drainage lines. The Snake River district will end on Dec. 31, 2018, although the agency may continue to receive some incremental money into 2019. 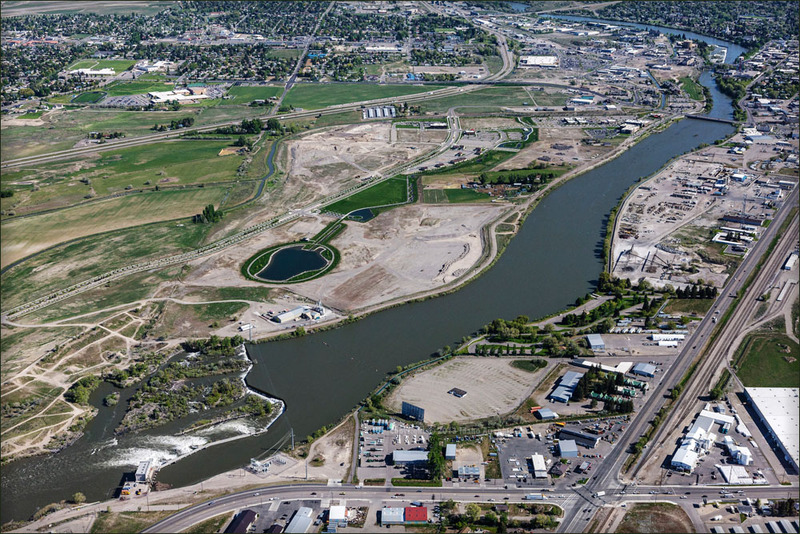 In 2004, the Mayor Linda Milam and council approved the creation of the River Commons Urban Renewal District on lands along the Snake River that for decades had been home to gravel pits and salvage years. The agency entered into a partnership with the developer of Snake River Landing, Ball Ventures, to finance the construction of Pier View Drive, portions of Snake River Parkway, Milligan Road within the city and Bluff Drive and accompanying public utilities. As of 2015, these improvements spurred an increase of $202,060,908 in the assessed value in these two districts. In 2015, Mayor Rebecca Casper and the council approved the Eagle Ridge District, the fourth district in the program. This district has already connected Snake River Parkway to Pioneer Road and a new intersection with Utah Avenue. Also in 2015, the Agency agreed to purchase the site of the former Saving Center grocery store and an option on the Bonneville Hotel. Both of these projects are planned to be used for mixed-use developments. Urban renewal has its detractors, including the Idaho Freedom Foundation, which routinely lobbies the Legislature to repeal the law. "It allows for the government to fictionalize property values," wrote Wayne Hoffman, the foundation's director, in an 2015 opinion piece titled Urban Renewal: Repeal is the Best Option. "When a piece of property is developed or improved, the local taxing districts are told to pretend the property is still undeveloped; they’ll still have to provide services to the developed property, but without the benefit of the increased property valuation. Only the urban renewal district gets to consider the property as developed for taxation purposes. That difference—between the value of the property as it was and as it is—is where urban renewal squeezes money out of taxpayers. That taxpayer money is often controlled by unelected and unaccountable urban renewal boards."